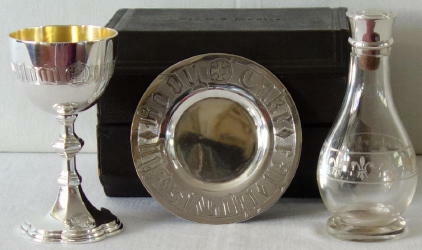 Antique Sterling Silver Communion Set. Victorian Sterling Silver Communion Set made in London 1876 by the silversmith firm Henry John Lias & Henry John Lias. Fully hallmarked throughout with the English Sterling Silver marks and the maker's name. 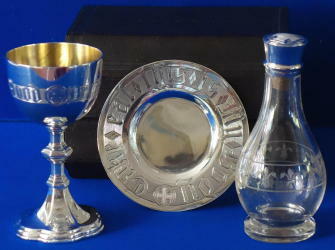 The set comprises sterling silver Chalice with Paten, crystal cruet with silver top, all in the original case supplied by Elkington & Company of Liverpool. The Chalice is in Gothic style with petalled base and hexagonal stem. The cup is engraved with Gothic style lettering 'Drink ye, This is My Blood'. The cup is gilded on the inside. The Paten is engraved in Gothic style lettering to the edge with 'Take, eat, This is My Body'. 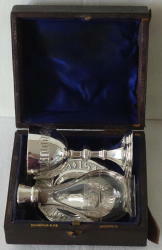 The crystal cruet is engraved with fleur de lys around the top. The silver stopper has an engraved cross to the top. Chalice measures 9.3cm high & 4.7cm wide across the cup. The Paten measures 8cm in diameter. The cruet is 10.5cm high. Total weight 217g. Weight of Chalice & Paten 104g. In excellent condition throughout. 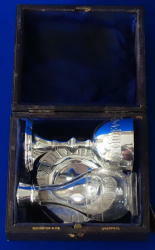 Please ask if you would like any further details or information about this English Victorian Communion Set. US$ prices are given as an estimate at the current exchange rate, but may vary slightly on the actual purchase.